Pictured: Bachelor of General Studies graduate Christy Grissom (middle) was recently awarded the UM Taylor Medal for highest academic achievement. 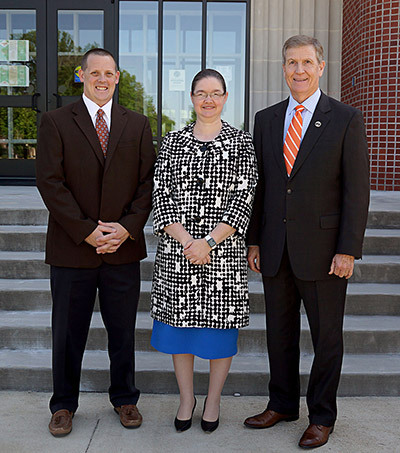 Grissom is congratulated by Derek Markley, (left) the executive director of the UM Tupelo and Booneville campuses and Ricky Ford (right) president of Northeast Mississippi Community College. BOONEVILLE, Miss.­­­ – Growing up, Barbara “Christy” Grissom of Iuka never really thought much about going to college after high school. She went to work at a local restaurant and then a local furniture manufacturing plant before events beyond her control changed the course of her future. Grissom had worked her way up to a lead position with Bauhaus USA, a furniture manufacturer in Iuka, before the company shut down the plant in 2007. It was then that she learned about a grant with the local Workforce Investment Act that was available to help employees go to college and train for new jobs. This life-altering change back in 2007, however, set events in motion that have led to Grissom being honored last month as a 2017 Taylor Medalist at the University of Mississippi. Only the top 1 percent of all Ole Miss students receives this award each year. Recipients must have at least a 3.90 grade-point average to be considered. “She’s quite simply superwoman,” said Tam Salter, bachelor of general studies adviser and instructor at the university’s Booneville regional campus. “She’s a full-time wife, mom, employee, teacher and student. Even with her many duties, she still found time to encourage her own students and her Ole Miss peers as they were working hard to earn their degrees. Grissom graduated from Iuka Christian Academy in 1987, married and started a family 10 years later. She and her husband have three boys, two of whom they adopted. She started at Northeast Mississippi Community College in 2007 and graduated with associate’s degrees in both culinary arts and hospitality management. Grissom credits academic adviser and mentor Tim Gilmore at Northeast with encouraging her to start teaching. He asked her about becoming certified to teach ServSafe training courses to other food service workers in north Mississippi. “This experience helped me to realize how much I enjoyed teaching and sharing my experiences from working in the industry,” Grissom said. In spring 2013, Gilmore became ill and officials at Northeast asked Grissom to cover his classes for the remainder of the semester. Grissom began teaching full-time in the culinary arts and hospitality management programs at Northeast that fall and was encouraged by her supervisors to work toward completing her bachelor’s degree. She enrolled in her prerequisite classes at Northeast before transferring into the Bachelor of General Studies program at the University of Mississippi at Booneville campus in fall 2015. Grissom said her favorite classes included the English language classes Descriptive Grammar and History of the English Language. “I enjoy a challenge, and these classes were challenging, but they were so interesting to me,” she said. Grissom said that writing is a special hobby. She has written an unpublished novel and would one day like to pursue writing nonfiction. Through her teaching and advising role in Northeast’s hospitality management program, she helps plan numerous catered events on the Booneville campus each year. These events also serve as hands-on training experiences for her students. “It’s great to see a student gain confidence during the planning process,” Grissom said. “They are usually nervous at the beginning, but by the end of the event they are excited to see it all come together. Grissom will be setting an example for her children as well as her students when she is honored at the UM Commencement this weekend. She will be recognized as one of the top of her class and seated on stage in the Grove with BGS Dean Tony Ammeter. Grissom said she hopes that by meeting her own educational goals, she will inspire her children to follow their own dreams. With plans to earn a master’s degree, Grissom is researching graduate programs in higher education, human and environmental services, and English.